Combine stuffing mixes, 3 cans chicken broth, chopped celery, and next 5 ingredients. 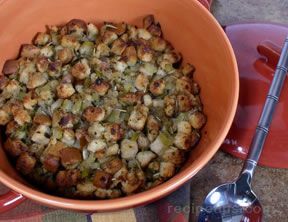 Spoon stuffing mixture evenly into a lightly greased 13x9-inch pan or baking dish. Pour remaining 1 can broth evenly over stuffing in pan. Bake at 350° for 40 to 45 minutes or until golden. 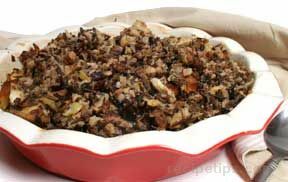 To make ahead: Spoon unbaked stuffing mixture into a lightly greased freezer-safe, disposable aluminum pan; cover and freeze up to 1 month. Thaw in refrigerator. Uncover and bake as directed above.